We are excited to present the 6th Annual Physical Therapy Showcase. 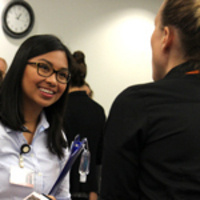 Student physical therapists will have the opportunity to network with potential employers and explore practice settings and career options. For more information, contact Susan Webster at swebster@pacific.edu or 209.946.3116. Thank you to University of the Pacific's Career Resource Center for sponsoring this event.